OSWEGO – Community members are invited to an open house held at The Manor at Seneca Hill, Oswego County’s only 3-star skilled nursing facility from 3 to 7 p.m. October 26. During the open house, tours of the facility’s skilled nursing services, short-term rehabilitation department and Adult Day Health Services program will be provided. “Our open house will allow residents a firsthand look at the high-quality programs offered at The Manor,” said Jason Santiago, Oswego Health vice president and The Manor’s chief operating officer. In addition to The Manor’s own services, staff from two other Oswego Health programs, Lifeline and Oswego Health Home Care, will be available at the open house to provide information on their respective programs. The event will be held in the facility’s second-floor dining room, with refreshments available. 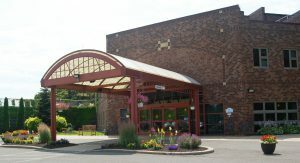 The Manor’s was awarded a 3-star rating, the highest overall score of any skilled nursing home facility in Oswego County by the Centers for Medicare and Medicaid. Along with this overall score, the facility achieved a 4-star on quality. The overall star award is based upon three individual star ratings, which include staffing, inspections and quality. In addition to this accolade, staff at The Manor was named the Health Care Faculty of the Year as a part of the Excellence in Health Care Awards presented by the Bankers Healthcare Group. Staff members at The Manor will be honored at a special evening event held at The Lodge at Welch Allyn in Skaneateles. Community members with questions on the open house can call 349-5300.